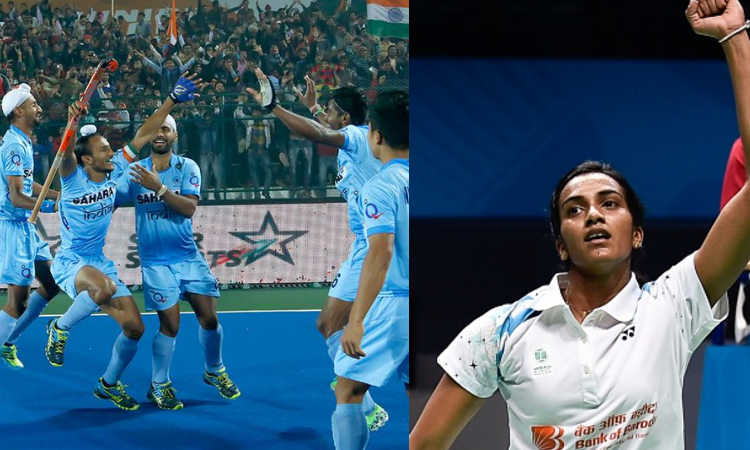 PV Sindhu: Consistency Is The Key For This Class Act! How can you not fall in love with the way she carries her off the field? Whether it is a win or a loss, the poise and panache that PV Sindhu has displayed has made all badminton fans across the world awe-struck. In fact, both players (Sindhu and Marin) such great rivalry on the pitch and off the field so great to see them sit together and talk! 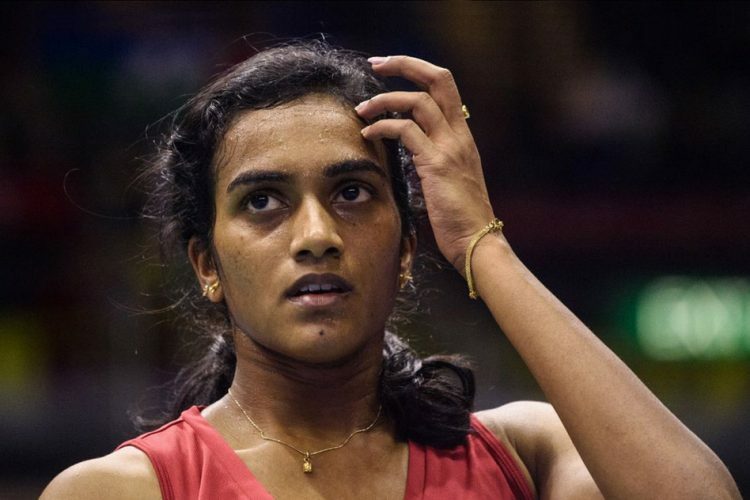 PV Sindhu struggled with her fitness levels in the All England Open at the start of the year. She was swept aside in the quarterfinals match by the eventual winner Tai Tzu Ying in straight sets 21-14 21-10 in a match that lasted 35 minutes. However, she bounced back by winning her maiden super series title in the Indian Super Series, in front of a packed home crowd. However, a busy schedule and the fact that she had played three setter games in the previous two matches meant that she lacked the much-needed rest to play at the Malaysian Super Series event just 2 days after her triumph. As a consequence, PV Sindhu was sent home packing in the first round by Chen Yufei of China. The match itself started on a good note as she won the first set but lost this thriller that went to the third set by 21-18, 19-21, 17-21. Soon after she also lost the next tournament, the Singapore Open quarter-final match to her Spanish counterpart Carolina Marin. Again, she was fatigued playing all three setters in the run-up to this match whereas Marin had it much easy. 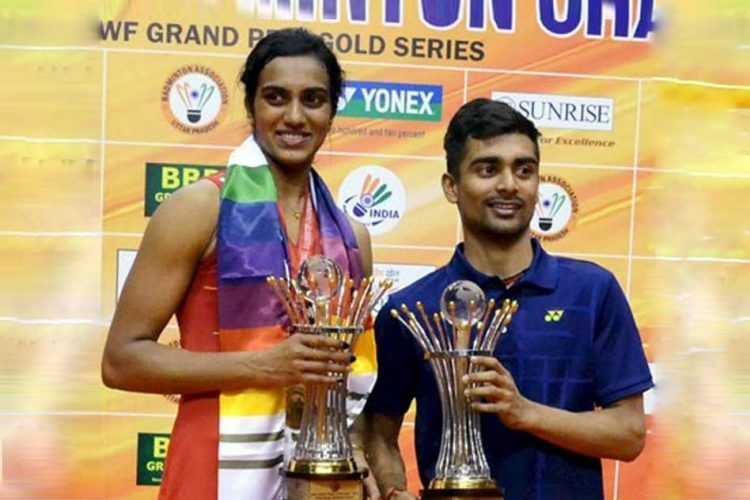 Let’s relive Sindhu’s maiden super-series and her rivalry with Marin in these tournaments. 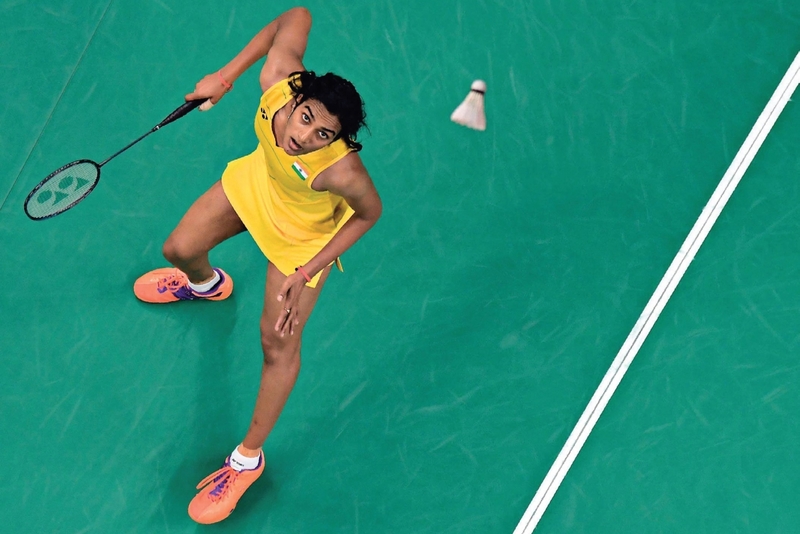 With much-needed home support by her side, PV Sindhu managed to outsmart the world no. 1 and reigning Olympic champion Carolina Marin in the finale of the Indian Super Series 2017. Here’s looking back at how the match panned out. 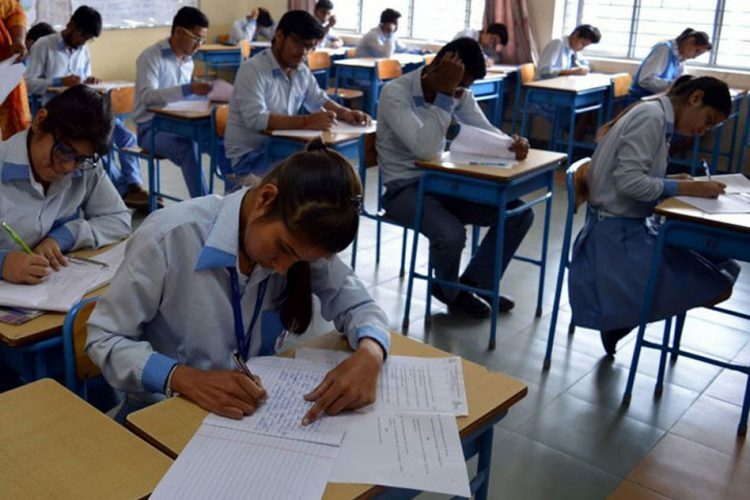 The Hyderabadi was dominant right from the word go and these were surely signs of what was to come! She lead 6-1 in the first set using drop shot and smashes alike. However, Marin came back strong after the first break and made Sindhu to go on the back foot, defending most of the times and committing unforced errors as she draw level at 16-all and then to take it to a nerve-wracking 19 points each. However, Sindhu relentlessly pursued long rallies to capitalize by a slender lead and that too at the right time. With smash and attack being her forte, she took the opening set 21-19. Here’s the set point she won. The Deccan queen came all prepared to thwart the very possibility of a Marin comeback, with all guns blazing in the second set. It was some close exchanges around the net as both players tried to outwit and outshine each other. As the Spaniard began to commit errors, Sindhu’s confidence grew and it was evident who was going to come out tops in this battle royale! Marin did go for the tried and tested formula of changing the shuttle, but she couldn’t break Sindhu’s momentum. Sindhu also played her part by irritating the world no. 1 with her delay tactics which led to Marin complaining to the chair umpire. There were no easy points as per Sindhu’s own admission and both battled hard to seize every opportunity that came by. However, point by point Sindhu moved close to what was a dream come true moment for every Indian fan and her, to win the revenge and repeat match of the Rio Olympics 2016 finale. Let’s relive the championship point! She immediately knew who to thank and meet after her win and, it was none other than Dronacharya awardee and Guru Pullela Gopichand. In the press meet after the match, she also thanked her Indonesian coaches Mulyo and Haryavan (who have been recently appointed to assist national coach Gopichand) with whom she has been training since the last two months. And then it was happy posing together to relive the real sportsman spirit – the game of badminton rose yet again to its pinnacle! PV Sindhu faced her Spanish counterpart, Carolina Marin for the 11th time and their head to head wins is now 6-5 in favour of Marin! The Spaniard outclassed Sindhu in straight sets 21-11, 21-15 in the Singapore Open quarterfinal match that lasted 35 minutes. However, she won the Indian Open final in straight sets 21-19, 21-16 in a total of 47 minutes to win her maiden Indian Super Series title and with it this was her 16th title win. 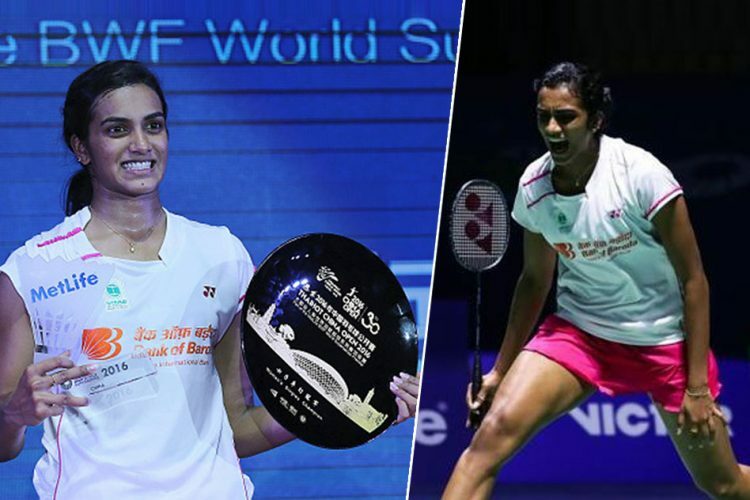 On April 6, PV Sindhu ascended to a career-best ranking of World No 2 after the latest update of rankings by the BWF (Badminton World Federation). 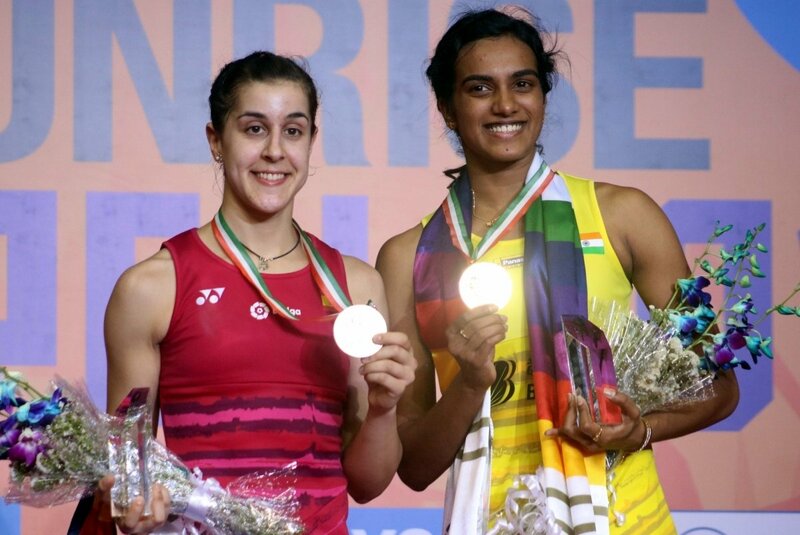 Sindhu’s leapfrog from her then sixth-placed position to displace the likes of Carolina Marin, Akane Yamaguchi (Marin defeated this other semi-finalist of the India Open) and Sung Ji Hyun (Sindhu defeated her in the semi-finals) was short lived. She slipped back to the fifth position after her first round exit at the Malaysian Super Series and subsequent loss to Marin in the Singapore Super Series Open. 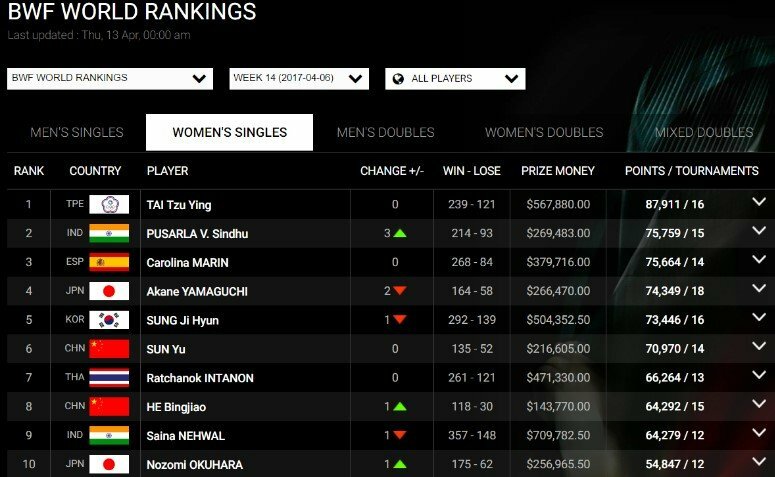 The BWF World rankings for Women’s Singles after the Indian Super Series. Note: The BWF world rankings accrue the points over the past 52 weeks. It was not just her silver winning exploits in Rio that captured the attention of a cricket-frenzy nation but the golden moments after the match that made the world notice her sportsmanship which was pure gold! The way Sindhu went over to congratulate and pick her opponent, keeping her calm showed us that she is a true ambassador of the sport. And to top it up with her infectious smile; hallmark of a champion! A legend in the making! We have seen great rivalries in sport, be it Federer and Nadal in Tennis, Messi and Ronaldo in Football or Warne vs Tendulkar in cricket. Both set of players have been great competitors yet had utmost respect for each other. 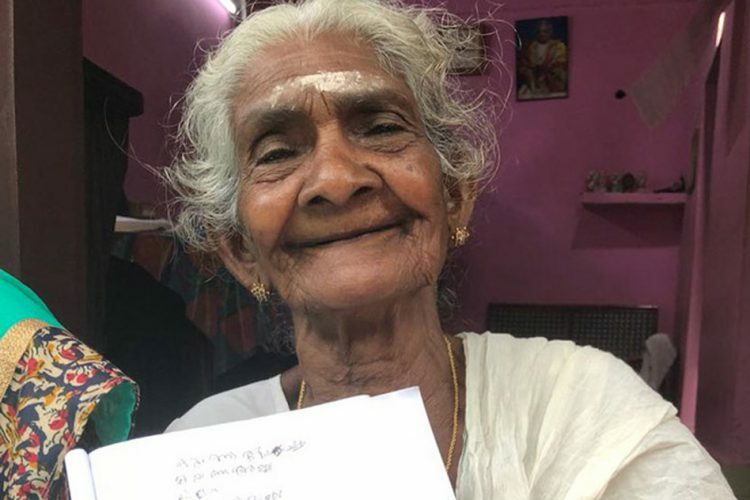 This rivalry between Marin and Sindhu draws parallels and is right there and even more important when it comes to writing down the annals of badminton! For a sport which was largely dominated by the Chinese, their reign at the top is a welcome change for all fans. As injuries took the better of Saina Nehwal, and with her subsequent quarter-final exit by Sindhu, the crown of Indian badminton queen now lies easily on the latter’s head. 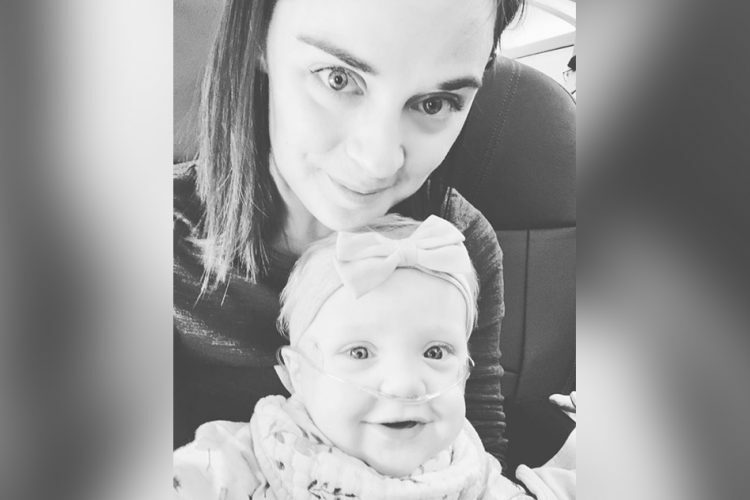 Her next assignment will be at the Indonesian Open World Superseries Premier in Jakarta where she would try to dislodge the current world no. 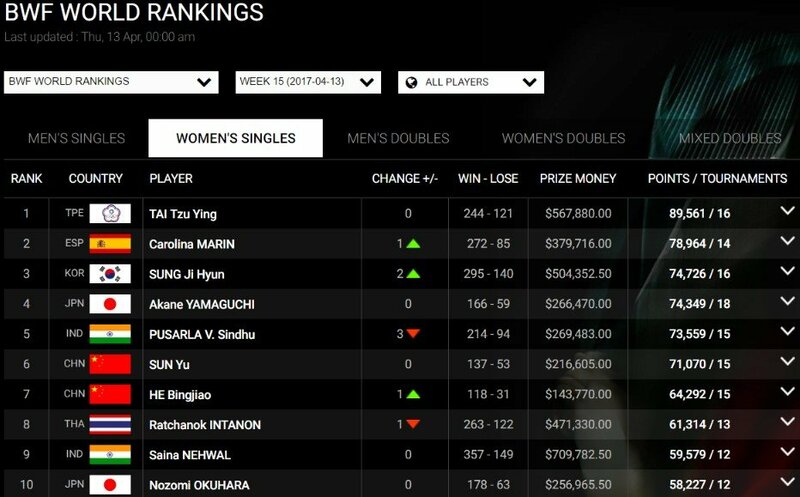 1 Tai Tzu Ying and defending champion. Later in the month, we have the Australian Open World Superseries in Sydney. Apparently, Saina is the defending champion at this event! And not to forget the fact that she would resume her rivalry with Carolina and which means some mouthwatering clashes await for all badminton viewers! Here’s wishing PV Sindhu all the very best for her future endeavours. She has toiled to be among the best five in the world. Consistency and fitness is much needed for her to maintain a steady ranking and stay true to her potential. Not just India but the world looks forward to welcoming the new star much like her beaming smile!